Inger Saltaag's (born 1956) art is governed by opposing tendencies: the one constructive, encouraging a calm, balanced mode of expression, the other an expressionistic will. The latter is the more prominent. Barrier-breaking forms, expression, themes, and size characterize many of Inger Saltaag's paintings. She is hunting for the Dionysian dimension in nature and art. Inger Saltaag studied painting at the National College of Art, Crafts, and Design in Oslo from 1976 to 1980, under Egil Weiglin, Victor Sparre, and Ørnulf Ranheimsæter. The time was well spent, not the least with respect to drawing. Bjarne Ness exerted a strong influence on the students. Between 1980 and 1984 she studied under the painters Alf-Jørgen Aas, Inger Sitter, Knut Rose, and Bjørn Carlsen at the National Art Academy in Oslo. Alf-Jørgen Aas was a good teacher, for whom color was important. Bjørn Carlsen was also very significant for Inger Saltaag. He was genuinely interested in his students and exceptionally good at conveying his knowledge. Later, in 1992-93, Inger Saltaag studied graphics at the Institute for Etching and Lithography at the National College of Art, Crafts, and Design. Apart from her painting, her development of graphic media has meant a great deal to Saltaag. Around 1980, painting returned to the international artistic scene in full strength after being banished during the 60's and 70's as dogmatic, academic, and no longer current as a form of expression. New techniques such as installation, performance, photography, and video had captured the public's fancy. Thus the art scene of the early 80's came under the influence of historicizing tendencies. The dogmatic expression we saw in the abstract/non-figurative art of the 60's and the art of political agitation of the 70's died out. A new pluralism coupled with a multi-faceted, subtle aesthetic was on the way in. The major, carefully planned 1981-exhibition A New Spirit in Painting at the Royal Academy of Arts in London signaled the onset of new directions. The exhibition 27 Young Painters followed upon the broadly conceived manifestation Sculpture en route. On home ground, it could well be viewed as a pendant to A New Spirit in Painting. The slogan "Back to painting" also had its day in Norway. The exhibition opened in the spring of 1981 first at Kunstnernes Hus in Oslo, then during the summer at Christianssands Kunstforening. The art critic Harald Flor emphasized that the exhibition embodied a strong desire to draw attention to the distinctive character of painting, but also to go beyond painting's traditional boundaries. 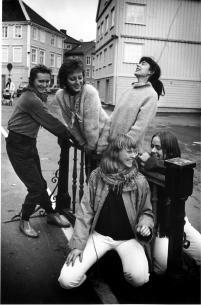 In the fall of 1982, fellow academicians (see the picture) Inger Saltaag (in front), Eli Hovdenak, Sidsel Huvestad, Vibeke Høegh, Eva Skaar, og Anne Karin Sundquist (not present) opened an exhibition in southern Norway. The six put together a traveling exhibition entitled Six Girls from the National Art Academy shown in Arendal, Lillesand, and Mandal. Huvestad and Skaar as well as Saltaag were from southern Norway. The exhibitors characterised themselves as expressionists. They stood for a color-strong, substantial and picturesque style of painting. Their forms were greatly simplified, and lines dynamic. A number of Inger Saltaag's earlier works are mural-like. Works such as Figure assise, Yinqy, Fyrsten og Urolig sinn, all from 1989, find their sources in the "severe" school of German painting, along with the Danish COBRA-painter Asger Jorn. Artists of this period were preoccupied by the mythical and expressive. Inger Saltaag had the painter Alf Kjær as her teacher when she studied painting and decoration at the Mandal School of Crafts (1973-1974). The art milieu in Mandal was marked by a French orientation. The artists Kjær, Rolf Syrdahl, and Hans Kristian Ziegler emphasized the formal aspects of painting. The same applied to the colourist Thore Heramb, who also belonged to the art milieu in Mandal. The academic art milieu in Paris in the interwar years, the tradition from cubism and abstract painting which we associated with the Parisian school, created the foundations of the tradition that Inger Saltaag grew up with in Mandal. The secure, balanced construction of the picture and harmonious use of color were central elements. The orientation towards French art tradition was further strengthened at the Academy by Saltaag's professors Alf-Jørgen Aas and Inger Sitter. 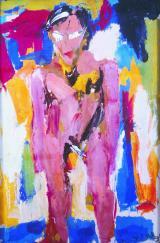 In the period 1986-1990 Inger Saltaag studied several times in Paris. In the years 1986-1987 she was given an atelier at Cité Internationale des Arts, and in 1993 she was awarded a studio in Fritz Thaulow's atelier. Inger Saltaag paints experiences from nature. She strives for an essential expression and content. She is searching for that which is original and strong, the primal forces in nature. She has been spellbound by the vast uplands of Åseral, and inspired by the soft and gentle beaches around Mandal. Saltaag's architectural decoration on the main wall in the Mandal City Hall, Ode til sommer (1989), is a good example of the artist's naturalist abstractions. The work is a triptych, an eight meter long frieze. The picture is inspired by the Mandal of her childhood, with the sun shining through pine trees at Risøbank out over bare rock and the still sea! Saltaag's knowledge of composition, her courageous, picturesque and visionary grasp gives the decoration a unified, clear, and mature character. 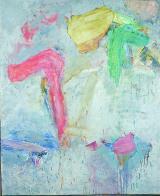 The titles of several of Inger Saltaag's paintings support their dynamic character. One of the largest paintings at the exhibition is called Ekspansjon (1999). The composition of the picture expresses the explosive forces which erupt from the center of the motif. The works Gi meg juni, Vårgrønt, og Vårløysing, all from 1999, appeal to strong natural forces. Dynamic pictorial elements and diagonal movement underline the dramatic themes of these paintings. The sun is one of the most important motifs in the art of Inger Saltaag. This is the main motif in her decoration in Mandal City Hall. We also find it in the painting For solen stiger (1990) and the graphic work Sommer from 1993. Inger Saltaag was awarded Archersprisen for this lithograph at Høstutstillingen 1993. Over the years, the cubistic references in Inger Saltaag's work have grown more evident. This is particularly clear in some of her lithographs, and in her collage and collage-inspired works. Their construction and structure, the use of bright colour-accentuation with distinctive areas in black as linking elements, all give Saltaag's paintings a decorative character. Rhythmic composition and tactile surfaces add to this aspect of her art. Saltaag's paintings can be said to have a textile-like character. Most of her paintings are strong, unsentimental statements. Sangen til et urlandskap (1999) is one of Inger Saltaag's most recent paintings. It is a complex picture. For one thing she has used mica in the painting. The picture has an illuminated character. The different elements of the painting are caught by the light as if they were in a showcase. The repetitive rhythm in the picture, the placement of elements on a white base, along with the light, illuminated character of the colors all give the painting an ornamental quality. It is easy to see a form of pantheism in Inger Saltaag's nature pictures. To illustrate, a religious perspective emerges in an early painting, Rød messe (1990). The painting Gjennom sort portal (1992) seems to open out towards a transcendental country. The mystical elements in musical tones and rhythms have also engaged Saltaag's attention. Musical references can be found in both her paintings and lithographic production. The life-rhythms and potential for life in nature, as well as its all-conquering forces, underlie Inger Saltaag's art. Nature's secretive heartbeats absorb the romantic. Saltaag seeks out the Dionysian forces - the strings of the wine god. Inger Saltaag balances Apollonarian rationalism against Dionysian intuition and emotion. Her paintings find their strength in the collaboration between articulate expression and principles of construction and decoration. By this, Saltaag's abstract visions of nature are strengthened. They are given an artistic form which is powerful and in keeping with their ample content. Most of Inger Saltaag's paintings are large, dark, and baroque. But Saltaag's art also has a lighter side. A tender, lyrical nerve recurs in several works. Among others, we can see it in Sangen til et urlandskap. In this manner, the Dionysian and Apollonarian light literally breaks through in her art.